Top-down approaches to fishing: dead in the water? How green is my city? Species on the brink of extinction are listed in Acts and Schedules, and directed conservation efforts are directed to protect their populations. What should happen when, as a result of these efforts, their numbers rise and the species recover? Should they now be categorised as ‘Not so Endangered’? 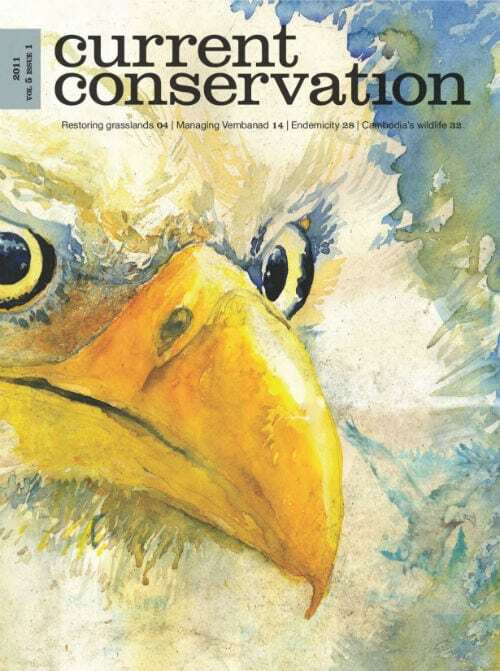 Caitlin Kight examines the case of the iconic Bald Eagle, listed and subsequently delisted in the USA. Janaki Lenin and Sandesh Kadur take us through a powerful visual tour of hunting practices in Northeast India, and in this photofeature they ask if such practices can be banned or if such a ban is justified. In this issue, we introduce ‘Then and Now’, a new section that presents viewpoints from the present and compares this to the past. A group of avid birders visit Vembanad, one of India’s largest wetlands, 70 years after Salim Ali documented its avifauna, and compare the present to the past. The change in the landscape and the impact on fauna reflect political and social changes and Cody Paterson from the present and compares this to the past. A group of avid birders visit Vembanad, one of India’s largest wetlands, 70 years after Salim Ali documented its the top-down approach to management in Vembanad that has altered the entire ecology of the wetland. Over the next few issues, we will follow these enthusiasts as they revisit Salim Ali’s explorations in Kerala, walking his trails, and on the same dates of the year.